Kumbha Mela is the largest group of humans to gather in one place. Their purpose is to take a holy ritual bath, together with ash-smeared Naga Babas, Sadhus, robed saints, hymn-chanting priests, yogis and preachers. This assembly of assorted characters also consists of astrologers, villagers, curious foreign tourists, Indian emigrants and various other seekers of salvation. 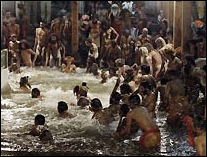 The Naga Babas hold the distinction of bathing first, and all other seekers are invited to take the dip afterward. Water has a central place in all the practices and beliefs for two main reasons. Firstly, water cleanses. Water washes away impurities and pollutants, it can make an object look as good as new and wipe away any signs of previous defilement. Water not only distils objects for ritual use, but can also make a person spotless, outwardly or spiritually, ready to come into the presence of their focus of worship. Secondly, water is a primary building block of life. Devoid of water there is no life, yet water has the power to destroy as well as to create. We are at the mercy of water just as we are at the mercy of our God/ Gods. The significance of water manifests itself differently in different religions and beliefs, but it is these two qualities of water that underlie its place in our cultures and faiths. Ganges being the site for convergence, between land and river or two, or even better three, rivers, carry special significance and are specially sacred. Sacred rivers are thought to be a great equalizer. Through the rivers, the pure are made even more pure and the impure have their pollution removed if only temporarily. In the sacred water distinctions of caste are supposed to count for nothing, as all sins fall away. These places are believed to be where drops of amrita - the nectar of immortality - fell to earth during a heavenly conflict. The ultimate goal of this Kumbha Mela festival is salvation and liberty from the endless cycle of birth and rebirth. As this pilgrimage is the single most important pilgrimage, people from all over the world make their arrangements years in advance. Accommodations are over loaded, and most planes, trains and automobiles are all already booked full for the occasion. Yet AstroVed understands the desire of others around the world to partake in this festival, and we are pleased to offer you the chance to be involved on many other different levels. Thanks to the blessings of our founder, Sri Dattatriya Siva Baba, we can ensure the authenticity of the ritual services we offer. Due to extraordinary efforts by devoted staff who will travel on your behalf, we can offer a range of options for you to participate in. 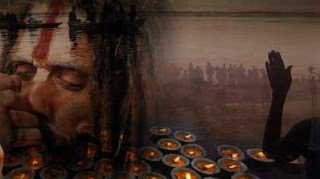 It is our great privilege to invite you to respond to the inner call for Kumbha Mela and to unite yourself along with others in the AstroVed global family with this unique, powerful and transformative spiritual event, the last Kumbha Mela before our planet encounters the shifts of 2012. If you have never participated in Kumbha Mela, this is the year to do so. Together, we can all do our part to help prepare our planet to go through the upcoming predicted changes as peacefully as possible. We are making it possible for our valued members to participate in the great purifying vortexes of Kumbha Mela to purify both on a personal and on a global level. The renewed purification of each person can and DOES make a difference to what happens to Planet Earth going forward! The Naga Babas Come Out of Their Himalayan Caves for Kumbha Mela: An Auspicious Time for the World! The Naga Babas (naked holy men and also some holy women) aim to resemble Siva, the Lord of Consciousness, who when naked, symbolizes his primal condition and non attachment to the world. They regard Siva's pure consciousness as the ultimate austerity. They are naked in their innocence and shave their heads symbolizing an infant taking its final birth and rub their body with ashes from their holy fires as the symbol of death and rebirth. They live high up in the Himalayas, renouncing the ordinary world to live in the extraordinary world of higher consciousness and direct experience of spirit. Yet they voluntarily leave their caves or hidden forest locations and begin a long trek across parts of India to rendezvous for Kumbha Mela. They come out of their normal solitude of meditation and appear naked in public at the Ganges for this initiation once every 12 years. They are drawn to be present so as to be part of this auspicious planetary shift. Kumbha Mela literally translated from Sanskrit means 'pitcher fair'. There is a significance to this...'pitcher' is the symbol for Aquarius, the water bearer who is pouring out water from his pitcher to share with others. 'Fair' is also a festival or gathering, and Kumbha Mela is a very large gathering of spiritually minded people as well as an extraordinary collection of saints and illuminated souls. Astrologically this event has a special timing. Kumbha Mela takes place in years when the planet Jupiter enters Aquarius, and the Sun enters Aries. This combination does not happen every year. These planetary positions occur together only every 12 years, and it said the positive energies actually medicate the river water turning it to nectar on these auspicious days making enormous purification possible. The origin of the festival is very old and dates back to the time of the story of creation, or the churning of the primordial sea. There was a tense war between the gods and demons over possession of the nectar of immortality. To prevent the nectar or 'amrita Kalasha' being taken by the more powerful demons, its safety was entrusted to the gods who are also planets, Jupiter, the Sun, the Moon and Saturn. These four planets ran away with the nectar to hide it from the demons. Learning the conspiracy of planets, the demons turned ferocious and chased the 4 planets running with the nectar. The chase, lasted 12 days and nights during which the gods and demons went round the earth and during this chase, some nectar spilled out at Haridwar, Prayag, Ujjain and Nasik. Therefore, every 12 years, this holy Event is commemorated at the above 4 sites when the three planets Jupiter Sun and Moon are in the below said signs.